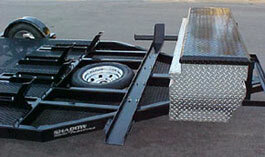 HALF THE FUN IS LOOKIN' GOOD GETTING THERE - Built to transport five motorcycles and features a 9-1/2 x 80 inch mesh deck. 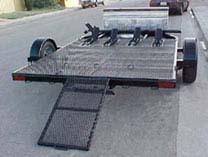 Optional equipment includes: Four can gas rack, 5 foot aluminum storage box, flush mounted spare tire and loading ramps. NOTE: The motorcycle boots are adjustable from front to rear. 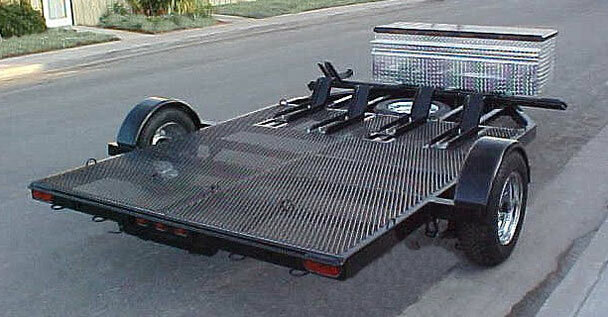 Manufactured By: SHADOW INDUSTRIES, INC.
© Shadow Trailers. All Rights Reserved.